1.1. In the beginning God created the heavens and the earth. 2. And the earth was totally empty, devoid of all life, (Jer. 4:23) both animal and plant; and darkness was upon the face of the deep. And the Spirit of God hovered, brooded, over the face of the waters. 1:3. And God said, “Light, Be!” And there was light. 4. And God saw the light, that it was good, and God divided the light from the darkness. 5. And God called the light Day, and the darkness He called Night. And there was evening and there was morning, day one. 1:6. And God said, “Firmament, Be in the midst of the waters! Divide the waters from the waters!” 7. And God made the firmament and divided the waters which were under the firmament from the waters which were above the firmament: and it was so. 8. And God called the firmament the Heavens. And there was evening and there was morning, the second day. 1:9. And God said, “Waters under the heavens, Be gathered together to one place! Dry land, Appear!” And it was so. 10. And God called the dry land Earth, and He called the gathering together of the waters the Seas. And God saw that it was good. 11. And God said, “Earth, Bring forth grass, the herb yielding seed, and the fruit tree yielding fruit after its kind, whose seed is in itself, upon the earth!” And it was so. 12. And the earth brought forth grass and herb yielding seed after its kind, and the tree yielding fruit, whose seed was in itself, after its kind. And God saw that it was good. 13. And there was evening and there was morning, the third day. 1:14. And God said, “Lights, Be in the firmament of the heavens, to divide the day from the night! Be for signs and for appointed times and for days and years! 15. Lights, Be in the firmament of the heavens to give light upon the earth!” And it was so. 16. And God made two great lights, the greater light to rule the day and the lesser light to rule the night. He made the stars also. 17. And God set them in the firmament of the heavens to give light upon the earth, 18. and to rule over the day and over the night, and to divide the light from the darkness. And God saw that it was good. 19. And there was evening and there was morning, the fourth day. 1:20. And God said, “Waters, Teem abundantly with the moving creature that has life, and fowl to fly above the earth in the open firmament of heaven!” 21. And God created the great whales and every living creature that moves, with which the waters teemed abundantly, after their kind and every winged fowl after its kind. And God saw that it was good. 22. And God blessed them saying, “Be fruitful! Multiply and fill the waters in the seas, and fowl, multiply on the earth!” 23. And there was evening and there was morning, the fifth day. 1:24. And God said, “Earth, Bring forth the living creature after its kind, cattle and creeping thing and beast of the earth after its kind!” And it was so. 25. And God made the beast of the earth after its kind and cattle after their kind and everything that creeps upon the earth after its kind. And God saw that it was good. 1:29. And God said, “Behold, I have given you every herb bearing seed which is upon the face of all the earth, and every tree in which is the fruit of a tree yielding seed; it will be food for you. 30. And to every beast of the earth, to every fowl of the air, and to everything that creeps upon the earth, in which there is life, I have given every green herb for food.” And it was so. 1:31. And God saw everything that He had made and, behold, it was very good. And there was evening and there was morning, the sixth day. 2.1. Thus the heavens and the earth and the entire host of them were finished. 2. And on the seventh day God ended His work which He had made, and He rested on the seventh day from all His work which He had made. (Heb. 4:4) 3. And God blessed the seventh day and sanctified it, because in it He had rested from all His work which God created and made. 2:4 These are the chronicles of the heavens and of the earth when they were created, in the day that the LORD* God made the earth and the heavens. 5. And no plant of the field was yet on the earth and no herb of the field had yet grown, for the LORD* God had not caused it to rain upon the earth, and there was not a man to till the ground. 6. But there went up a mist from the earth and it watered the whole face of the ground. 7. And the LORD* God formed man from the dust of the ground and blew into his nostrils the breath of life, and man became a living being. 2:10. And a river went out of Eden to water the garden, and from there it was divided, and became into four headwaters. 11. The name of the first headwater is Pishon: that is it which encompasses the whole land of Havilah, where there is gold. 12. And the gold of that land is good: there is bdellium and the onyx stone. 13. And the name of the second river is Gihon: the one that encompasses the whole land of Cush. 14. And the name of the third river is Hiddekel: that it is which goes toward the east of Assyria. And the fourth river is Euphrates. 2:18. And the LORD* God said, “It is not good that the man, Adam, should be alone. I shall make a helper for him, corresponding to him.” 19. And out of the ground the LORD* formed every beast of the field and every fowl of the air, and brought them to Adam to see what he would call them, and whatever Adam called every living creature, that was its name. 20. And Adam gave names to all cattle, to the fowl of the air, and to every beast of the field, but for Adam there was not found a helper for him. 2:21. And the LORD* God caused a deep sleep to fall upon Adam, and he slept. And He took one of his ribs and closed up the flesh in its place. 22. And He built the rib, which the LORD* God had taken from man, into a woman and brought her to the man. 23. And Adam said, “This is now bone of my bones and flesh of my flesh. She will be called Wife (Ishah), because she was taken out of Husband (Ish). 2:25. And they were both naked, the man and his wife, and were not ashamed. 3:20. And Adam called his wife’s name Eve because she was the mother of all living. 3:21. For Adam and also for his wife the LORD* God made garments of skins, and clothed them. 3:22. 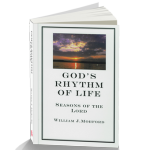 And the LORD* God said, “Behold, the man has become as one of us, knowing good and bad, and now, lest he put forth his hand and take also of the tree of life and eat and live forever.” (Rev. 22:2,14) 23. Therefore the LORD* God sent him out from the Garden of Eden, to till the ground from where he was taken. 24. So he drove the man out and He placed the Cherubim at the east of the Garden of Eden, and a flaming sword which turned every way, to guard the way to the tree of life. 4.1. And Adam knew Eve his wife and she conceived and bore Cain (Kayin), and said, “I have gotten a man from the LORD*.” 2. And she again bore his brother Abel (Hevel). And Abel was a keeper of sheep, but Cain was a tiller of the ground. 4:8. And Cain talked with Abel his brother, and it happened when they were in the field that Cain rose to Abel his brother, and slew him. 9. And the LORD* said to Cain, “Where is Abel your brother?” And he said, “I did not know. Am I my brother’s keeper?” 10. And He said, “What have you done? The voice of your brother’s blood cries to Me from the ground. (Heb. 11:4) 11. And now you are cursed from the earth, which has opened its mouth to receive your brother’s blood from your hand. 12. When you till the ground, from now on it will not yield its strength to you. You will be a fugitive and a vagabond on the earth.” 13. And Cain said to the LORD*, “My punishment is greater than I can bear. 14. Behold, You have driven me out this day from the face of the earth and I shall be hidden from Your face, and I shall be a fugitive and a vagabond on the earth, and it will be that everyone who finds me will slay me.” 15. And the LORD* said to him, “Therefore whoever slays Cain, vengeance will be taken on him sevenfold.” And the LORD* set a mark upon Cain, lest anyone finding him should kill him. 16. And Cain went out from the presence of the LORD* and dwelled in the land of Nod, on the east of Eden. 4:17. And Cain knew his wife and she conceived, and bore Enoch: and he was building a city, and called the name of the city after the name of his son, Enoch. 18. And to Enoch was born Irad and Irad begot Mehujael and Mehujael begot Methusala and Methusala begot Lemekh. 4:19. And Lemekh took two wives for himself: the name of the one was Adah and the name of the other Zillah. 20. And Adah bore Jabal: he was the father of all who dwell in tents, and of such as have cattle. 21. And his brother’s name was Jubal: he was the father of all who handle the harp and another stringed instrument. 22. And Zillah, she also bore Tubal-cain, a sharpener of every cutting tool in bronze and iron, and the sister of Tubal-cain was Naamah. 4:25 And Adam knew his wife again, and she bore a son and called his name Seth (Shet), “For God has appointed me another seed instead of Abel, whom Cain slew.” 26. And to Seth, a son was born to him also and he called his name Enosh. Then men began to call upon the name of the LORD*. 5.1. 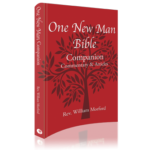 This is the book of the generations of Adam. In the day that God created mankind, He made him in the likeness of God. 2. He created them male and female and blessed them, and called their name Mankind (Adam), in the day when they were created. 3. And Adam lived a hundred thirty years and begot in his own likeness, after his image and called his name Seth. 4. And the days of Adam after he had begotten Seth were eight hundred years, and he begot sons and daughters. 5. And all the days that Adam lived were nine hundred thirty years and he died. 5:6. Seth lived one hundred five years and begot Enosh. 7. And Seth lived eight hundred seven years after he begot Enosh, and begot sons and daughters, 8. and all the days of Seth were nine hundred twelve years and he died. 5:9. And Enosh lived ninety years and begot Kenan. 10. And Enosh lived eight hundred fifteen years after he begot Kenan, and begot sons and daughters. 11. And all the days of Enosh were nine hundred five years, then he died. 5:12. And Kenan lived seventy years and begot Mahalalel. 13. And Kenan lived after he begot Mahalalel eight hundred forty years, and begot sons and daughters. 14. And all the days of Kenan were nine hundred ten years, then he died. 5:15. And Mahalalel lived sixty-five years and begot Jared. 16. And after he begot Jared, Mahalalel lived eight hundred thirty years and begot sons and daughters. 17. And all the days of Mahalalel were eight hundred ninety-five years, then he died. 5:18. And Jared lived one hundred sixty-two years, and he begot Enoch. 19. And Jared lived eight hundred years after he begot Enoch, and begot sons and daughters. 20. And all the days of Jared were nine hundred sixty-two years, then he died. 5:25. And Methuselah lived one hundred eighty-seven years and begot Lemekh. 26. And Methuselah lived after he begot Lemekh seven hundred eighty-two years and begot sons and daughters. 27. And all the days of Methuselahwere nine hundred sixty-nine years, then he died. 5:28. And Lemekh lived one hundred eighty-two years, and begot a son. 29. And he called his name Noah saying, “This one will bring us comfort from our work and the toil of our hands, from the ground which the LORD* has cursed.” 30. And Lemekh lived five hundred ninety-five years after he begot Noah, and begot sons and daughters. 31. All the days of Lemekh were seven hundred seventy-seven years, then he died. 5:32. And Noah was five hundred years old, and Noah begot Shem, Ham and Japheth. 6:4. There were giants in the earth in those days and also after that, when the sons of the leaders came in to the daughters of men, and they bore children to them, the same became mighty, macho, men who, from old, were men of bad reputation. 6:5. And God saw that the wickedness of man was great in the earth, and every imagination of the thoughts of his heart was continually only bad. 6. And the LORD* was sorry that he had made man on the earth, and it grieved Him in His heart. 7. And the LORD* said, “I shall destroy man, whom I have created, from the face of the earth: man, beast, the creeping thing, and the fowls of the air, for I am sorry that I have made them.” 8. But Noah found favor in the eyes of the LORD*. I saw you for the first time on Sid Roth about a month ago. 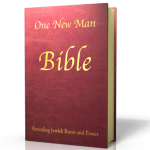 I ordered the One New Man Bible and should have it by the end of June. I am looking forward to reading this translation. I love God’s Truth and I want to understand The Bible as God intended us to understand His Word to us. 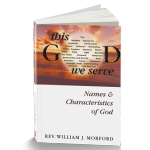 Thank you for writing and for ordering the Bible. 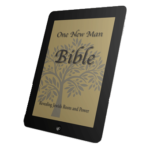 Please feel free to comment or ask questions when you have the ONM Bilbe. Why did you use the name LORD* in Genesis 2:4 instead of YHWH or Yahweh? Thank for asking. The first drafts were as you suggest, but Jewish friends told that using them would not be liked by many Jewish readers, so I used LORD*. Gen 6:2. that the sons of the leaders saw the daughters of men, that they were fair and they took them for wives of all whom they chose. Hi morford I thought this is refers to the fallen angels? But why is it sons of the leaders? Fallen angels is not a reasonable translation of the Hebrew Elohim. Even if it were, Matt. 22:30 says the angels in heaven neither marry not are given in marriage. A fallen angel would not have attributes of that nature if the heavenly angels do not. Others translate that gods came down, but false gods do not breathe, speak, hear, or do anything else, they are dumb things made by human hands. On the other hand, there are other cases where Elohim refers to humans, detailed in the footnotes. In chapter 6 of Genesis it saids that the children of the sons of God and daughters of man are Giant, can you please explain who are these giants. They are not sons of gods (certainly not sons of God) and their children are not giants. Read an accurate translation. Thank you very much now I get it. Haha may the Lord bless u and ur family amen. Thank you! The LORD will bless you. First Sabbath would like to learn more about the Sabbath and how to keep it. It is important to honor the Sabbath. The most important element is to spend time with God, next to rest. Everyone needs a day of rest. The Glossary has an article on the Sabbath, which we are to understand, but not get into legalism over those points. The fact that the earth was totally empty on the first day does not make a case for a pre-Adamic Race. True but it does say that earth was chaotic before God brought order to it. Throughout all of the creation process we see God putting things in order. The earth couldn’t have been vacant like that for no reason, something happened. Their could’ve been a battle in the heavens, and Satan crash landing on earth making the whole earth desolate. My point is God is a God of perfection and order everything he speaks and does is perfect. I can’t see God making a hideous earth. The earth was not chaotic, just empty, with no living things, animal or vegetable. There is no such battle reported, except later in Isaiah 14 where Satan is thrown out – but no battle. The war is now in the heavenlies which we as a church are to be waging. That actually makes sense, I see that but wasn’t that a parable about the King of Tyre? 2) In Christianity it’s considered literal. So my question is was Satan in heaven that whole time until Jesus came? Comment #1: I have not heard that. I believe the literal is correct. Comment #2: Satan’s fall from heaven was very early in time, possibly before creation of the earth. Y’shua was with God before creation. John 1:1 says He was from the beginning. Yes, and note the two footnotes for that verse.